One of my favorite flavor combinations is Blackberry & Apple. This Blackberry & Apple pie is absolutely delicious, has amazing fall flavors and is a fun twist on the usual pies we see at this time of the year. 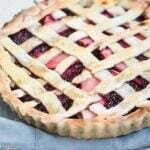 The lattice gives a rustic look to the pie. Don’t worry if it breaks, it’s all part of the rustic, handmade charm, right?! I’m entering this pie as part of the 2nd Annual Battle of the Pies, sponsored by Wayfair. Last year, I made Granny’s Puff Pastry Apple Pie but this year’s pie has a whole new flavor profile that I really love (plus, it’s easier to make!). A great tip when baking pies is to use a Pyrex pie dish, like this one from Wayfair. The Pyrex allows the heat to distribute evenly which means no soggy bottom on your pie! In a bowl mix the butter, flour, and sugar until everything is fully combined. Slowly mix in the water and keep mixing until thick. Press the dough into a previously greased pie mold and take to the fridge for 10 minutes. Save some dough for the lattice. Slice the apples and take to a saucepan over low heat. Add the blackberries, sugar, and milk. Mix for 5 minutes then add the butter and mix for additional 5 minutes. Let cool slightly, then pour into the crust. On a floured surface roll the remaining crust dough. Cut into half inch strips and place on top of the pie forming a lattice pattern. Beat the egg and brush the lattice with it. Sprinkle with some sugar on top and bake for 15 minutes or until done pastry is golden. Great recipe Jenna, you are featured this week on Oh my Heartsie Girl’s WW. Watch for it. Yum! This pie look both delicious and gorgeous! Pinned and sharing. Thank you for linking up at Family Joy Blog Link-Up Party this week. We hope to see you back again starting Sunday at 12 EST. I need to use some mulberries in this recipe. Looks great! Sounds delicious! Thanks for sharing on the What’s for Dinner link up and don’t forget to leave a comment at the party – Next week’s features that also leave a comment get pinned, yummed and tweeted!